Happiness is the full use of your powers along lines of excellence. When we got into office, the thing that surprised me the most was that things were as bad as we'd been saying they were. There are three things which are real: God, human folly, and laughter. The first two are beyond our comprehension. So we must do what we can with the third. No easy problem ever comes to the President of the United States. If they are easy to solve, somebody else has solved them. A man does what he must, in spite of personal consequences, in spite of obstacles and dangers and pressures, and that is the basis of all human morality. The energy, the faith, the devotion which we bring this endeavor will light our bounty and all who serve it, and the glow from that fire can truly light the world. Let the word go forth from this time and place, to friend and foe alike, that the torch has been passed to a new generation of Americans. We set sail on this new sea because there is knowledge to be gained. 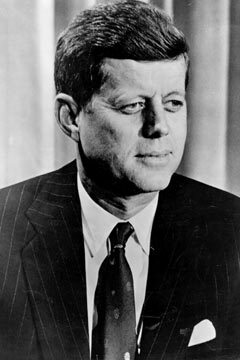 59 quotes by John F. Kennedy.